On paper, this mix is a tricky one to sell. I realised this when trying to explain it to Wrongtom, whose reaction was at best cautionary. What ZedVantz has done here is take a selection of classic ragtime/dixie style jazz beat tracks and blended it into one blinding 30 minute mix. With a style of music such as this one I’d argue that its a VERY thin line between brilliance and twee drivel. However ZedVantz negotiates that line with aplomb, delivering an exhilarating listen that can’t help but get you nodding your head, whilst drawing attention to a fairly small but brilliant line in obscure twists on a classic genre. What inspired the mix was that “Swing Set” song by Cut Chemist featured on the first Jurassic 5 album. Its also the last song on this mix. It was old swing/jazz music mixed with break beats. I wanted more! So, I started collecting/searching for hiphop instrumentals with jazz samples. I made a few mixtapes but nothing that stuck. Then in recent years all these great labels started popping up – Jazz & Milk, Melting Pot etc – so I just took all the beats I had and kept filtering it down to the best of the best, with an end result being this nice short 35 min mix; no filler, dope from beginning to end. I couldn’t agree more. So, download the mix for yourselves and take a listen. As ever comments are welcome below! This entry was posted on Tuesday, June 24th, 2008 at 10:46 am. 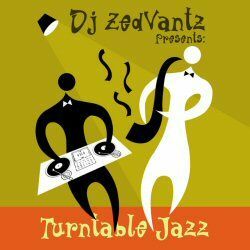 It is filed under Podcasts, Guest Mixes and tagged with DJ ZedVAntz, Turntable Jazz. You can follow any responses to this entry through the RSS 2.0 feed.